During 15 years of presidency, Azerbaijani President Ilham Aliyev, relying on a civil unity platform, the foundation of which was laid by national leader Heydar Aliyev, first of all strengthened internal public and political stability, says Azerbaijani President’s Assistant for Public and Political Affairs, department head, professor Ali Hasanov wrote in his article on the results of President Ilham Aliyev`s 15 years in power. “President Ilham Aliyev ensured security of the population, the fundamental rights and freedoms of the people, tranquillity in the country, and succeeded in gradually improving well-being of citizens,” he added. “We can say without hesitation that Azerbaijan takes the first place in the post-Soviet area thanks to internal national civil unity and the strong public and political stability factor, which is based on the broader public support for the government's policy,” Hasanov said. He stressed that Azerbaijan has reinforced its position in the top three in the region over the last 15 years on a number of other key parameters of domestic development, including macroeconomic stability, dynamic economic development, dynamics of public and moral security system, positive demographic situation, effective government control of migration and urbanization processes and effective public administration. 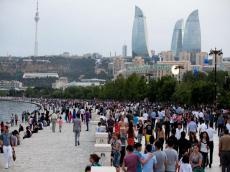 “Thanks to President Ilham Aliyev’s foreign policy, which is based on national interests, Azerbaijan has been recognized as a state that has its independent standing, and its international influence has gradually increased,” he said. “In 2011, Azerbaijan was elected as a non-permanent member of the UN Security Council with the support of 155 countries and became a member of the Non-Aligned Movement, which includes 120 countries,” Hasanov said. “Azerbaijan will chair the movement in 2019-2022. Azerbaijan has established strategic partnership relations and signed relevant documents with nine EU member states."